A side dish worthy enough to go with your delicious meal. 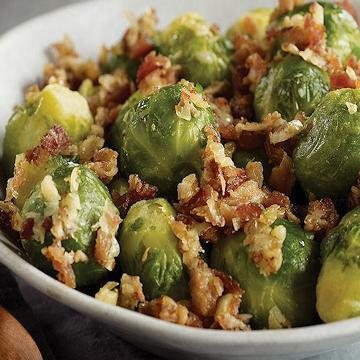 This all-new premium dish offers hand-selected Brussels sprouts, chunks of smoky pork bacon and perfectly sautéed shallots. It's a satisfying, deep and complex flavor with a perfect balance of crunch and butter. And this stylish side doesn't even need to simmer - these Brussels sprouts are delivered par-cooked and mixed perfectly with sautéed shallots and crispy bacon. All you need to do for the perfect result is place in the oven or microwave. Look no further for the dish that ties it all together. Ingredients: Brussels Sprouts, Shallots, Butter (Cream, Salt), Bacon (Cured With Water, Salt, Smoke Flavoring, Sodium Phosphate, Sodium Erythorbate, Sodium Nitrite. May Contain Sugar, Brown Sugar), Water, Modified Corn Starch, Salt, Spice. Contains: Milk. This Product Was Processed On Machinery That Was Used To Process Product Containing (Wheat).